The following article was published in Nature News, Midland Express, 6th June 2017. 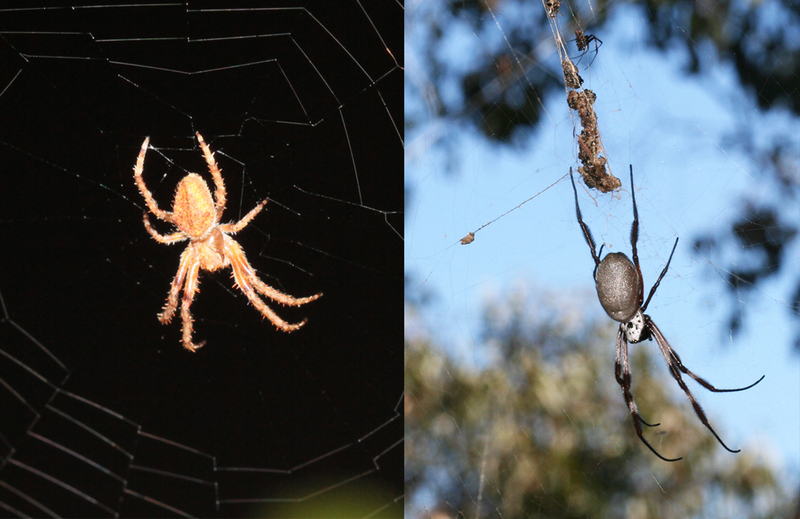 Local writer Dr. Lynne Kelly shares her love of spiders and knowledge of two local species of Orbweavers commonly found in the Castlemaine region. I adore spiders. I used to be an arachnophobe but knowledge cures an irrational fear, slowly at first. Then one day I watched an orbweaver spin her web from start to finish. That was the day I became a spider-obsessive. In the Mount Alexander Shire two varieties of orbweavers dominate – the large golden orbweavers who stay on their webs all day and the slightly smaller garden orbweavers that spin in the evening and scamper to hide in the foliage at dawn. We have a few species of garden orbweavers. They are all in the Eriophora genus, distinguished by two prominent projections near the front of the abdomen. Garden orbweavers usually remove most of their web before dawn, re-absorbing the protein in the silk to use again. A single reinforced strand is left across the gap between bushes or trees in the hope that it will still be there the following evening. If that strand is broken, the spider will point her abdomen skyward and release a fine filament of silk. In even the slightest breeze, this silk will catch on foliage and she will rush across, back and forward, to reinforce the mainstay of her web. She will then drop to the ground and attach an anchor. She’ll rush up again to spin the radials and a spiral outwards. From the edge of her nearly complete web, she will then circle back towards the centre laying down the sticky spiral. Having worked tirelessly for nearly an hour, she will rest, head down, waiting for her prey. Unlike the garden orbweavers, the huge golden orbweavers stay on the web all day, constantly repairing and reinforcing it. It is not the spider which is golden but the glow of the silk when it catches the sun. All the individuals I’ve seen locally are the Australian Golden Orbweaver (Nephila edulis). Discarded debris is left in the web above the spider to confuse the birds. Male garden orbweavers are only marginally smaller than their females but the males of the golden orbweavers are tiny by comparison [see above photo on right]. Although the males of most spider species will survive their sexual encounters, the Nephila males sacrifice themselves in their final act. Having produced a golden egg sac, the female will then die with the first frost. 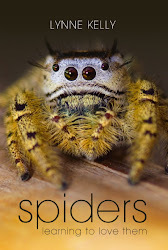 For further reading, Lynne’s book, “Spiders: learning to love them” (Allen & Unwin, 2009) is an excellent resource for those interested in finding out more about these amazing creatures. Wow! Another person who likes spiders! Hi there! Say, what would things be like if we had spiders the size of ponies, and we could ride them like 8 legged horsies? And maybe they could be trained to flick their abdomen hairs at bad guys! Love your imagination. That sounds like the plot for a sci fi novel! Trained hair flicking massive spiders. I want one! Awwww thank you! I like the big spiders myself, because you can hold them and they're usually docile, and if you do mess up and they bite you, their venom won't liquefy your insides and kill you! Now that comment will seem strange to many Australians. Can I assume that you are in America or England and have a pet tarantula? In Australia, we can't have your gentle tarantulas (if I am right in guessing the above) because they would be a disease threat to our local spiders. But our tarantulas are Old World, not New World, and far less docile than yours. So they aren't kept as pets and allowed to crawl up your arm. Large spiders are the huntsman (do Americans call them huntsman or giant crab spiders? They are fast and less predictable, so rarely kept as pets. Spiders as pets here are rare. Or have I got it all wrong? What sort of spider is Sammy? Great to meet another spider fanatic who also names them. Yes I'm in America. Sammy is a Mexican Redknee Tarantula. I can't have a Huntsman... Well I could as I'm a cartoon, but I'm not allowed to have one. Say, I just remembered something... Australian Funnel-web spiders are really mean. They hate everybody, even other spiders. Mexican Redknees are stunning creatures. Lucky you and lucky Sammy. And you can meet Laura too! Looks good and very creative! Can anyone help me identify the spider in this video? Not without a great deal more detail than that! Sorry! I am glad to hear about your book on spiders today. Unfortunately, I cannot get my copy in Egypt, but at least I can say hello and to send you my best wishes from Cairo. I too am a recovering arachnophobe. I will have to see about getting ahold of your book! I recently acquired an accidental houseguest of the eight legged variety. I know she is an orb weaver, but not sure what kind. When I first noticed her she was about the size of the head of a dressmaker's pin. I have fed her a few flies and a very small grasshopper, and she is now the size of a dried pea. She is light orange in color and has a "horn-like" protuberance on either side of the backside of her abdomen, and when she gets bigger she will have spiny looking hairs on her legs. I would share a pic of a larger predecessor, but not sure how to attach. My big question is, do you know how often I should feed her? I bought some small crickets for her on Saturday and she ate one that evening. I don't have the heart to kick her out because it's too cold out for her to survive now. Thanks for your attention to my query. I love New Mexico! I wrote about it a lot in my PhD thesis and then the two subsequent books - but that was about Indigenous memory systems and archaeology - so the Pueblo and Chaco Canyon were the attraction. I was only there for 5 days research in 2009 but fell in love with the place. You are so lucky to have such a delightful house guest. It is late in the season there, and I don't know your species nor their life cycle. There are so many orb weavers. They don't need a lot of food, so weekly would probably be fine. I have never hand fed a spider and mine seem to manage it themselves, but they are mostly not inside. They can survive months without food, according to the references. I have never tested that theory. But she won't need huge amounts. Sorry I can't be more help. Please let me know how things go. If you do want to send a photo, then use my email: Lynne @ lynnekelly.com.au (without the spaces). Does this spiders are poisons?